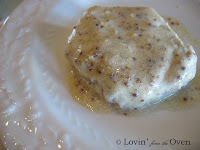 Frieda Loves Bread: Pork Chops and...Mustard! Pork chops and....applesauce! Where have you heard that before? If you are from my generation, you will know that line from the Brady Bunch. This line was my husband's response when he asked what was for dinner and I told him, "Pork chops." This recipe came highly recommended from my friend at Comemos, Let's Eat. It is a Nigella Lawson creation, a gal from the Food Network. It is a very easy, simple recipe! If you do not have pork, you can definitely use chicken. It made for a very tender pork that was sweet with a little "tang" on the side. I used the pork chops from Costco and cut them in half. Trim the fat off the chops and put them between plastic wrap; pound thin with a rolling pin. Heat oil in the pan and cook chops over medium-high heat for about 5 minutes per side. Remove to a plate and keep warm. Pour cider into the pan, deglaze. Let it cook for 1 minute; add mustard and stir in the cream. Add back the chops and serve. THE NEW RACHEL RAY? LOL... REALLY START YOUR OWN SHOW JUST LIKE HER!! HOPE UR DOIN WELL. ps... U making me very very hungry!! and I have to be on Glutten Free food probably for another yr sigh!!!! Im coming to your house once im off this diet lol!! !